Work on your panic braking skills. 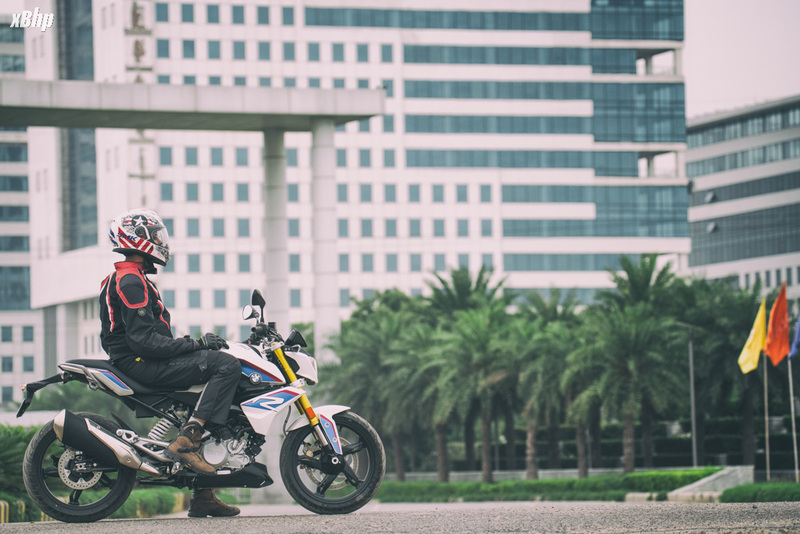 Indian motorcycling has undergone a tremendous change in the last decade or so. The surge in the number of motorcyclists saw world’s top players looking at India as a market with a lot of potential and a deep pocket. 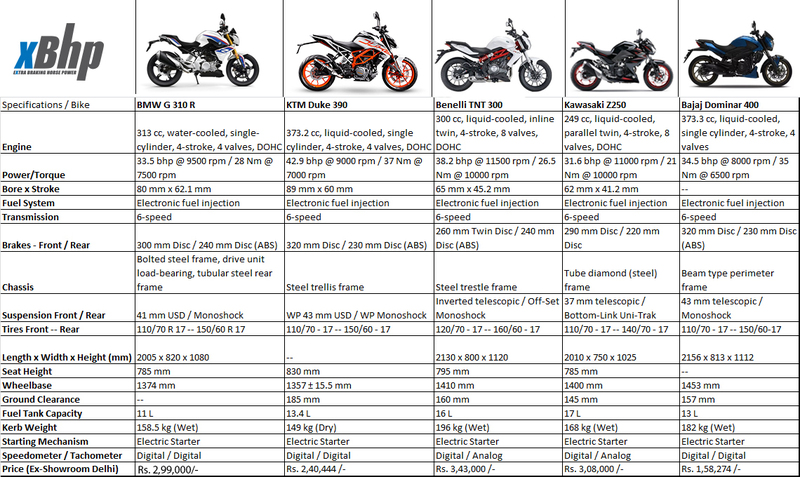 As a result of all that we have almost all the best motorcycles from the top manufacturers available here in our market. The focus of most of these manufacturers has been the premium-entry level segment i.e. 200-400 cc and those who did not eye this segment initially are now doing so. 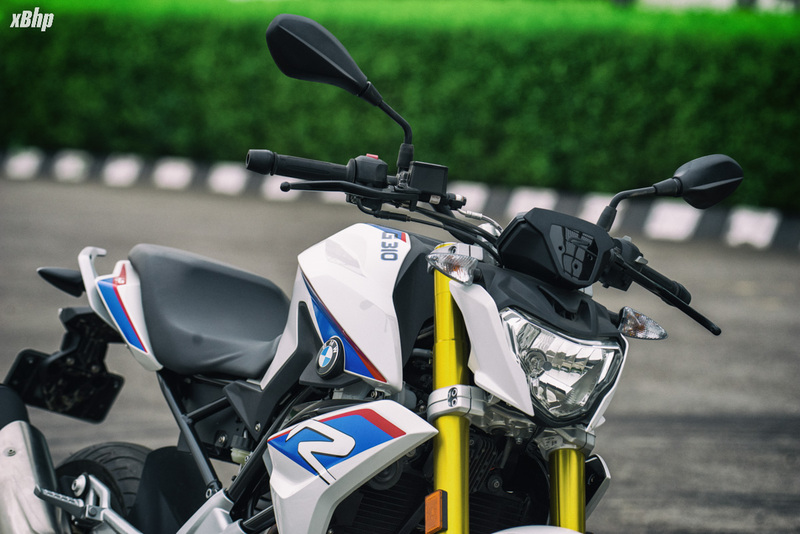 Something similar was done by BMW Motorrad when they, in association with TVS, unveiled and just recently launched the BMW G 310 R and G 310 GS here in India. These motorcycles were being made in India and sold worldwide but their arrival in the Indian market took quite some time. We had tested the two G 310 siblings in Australia some time ago (read about it here) and now we test them out here in India as- the wait is finally over. 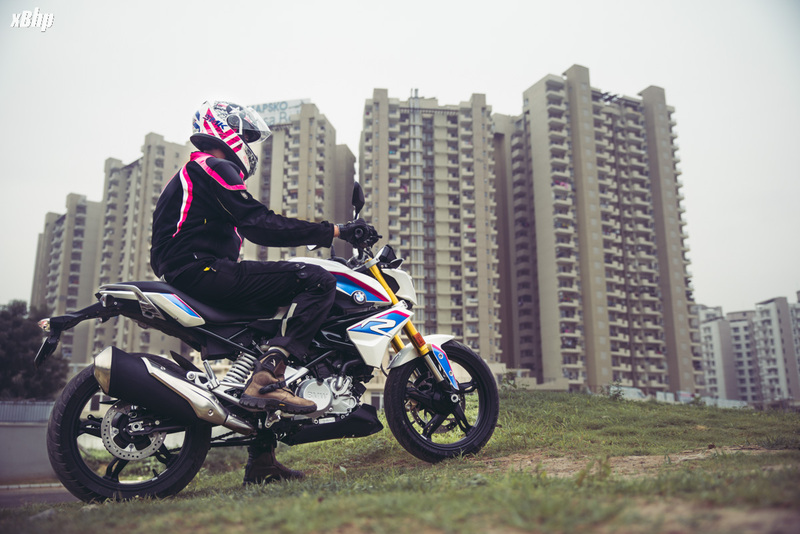 Now, the coast seems to be clear for the BMW G 310 GS because of the lack of competition here in India, but the G 310 R can easily be referred to as a latecomer to the party. We are already spoilt for choices when it comes to naked 200-400cc category and the addition of a Bavarian mini-rocket only makes the choices difficult. 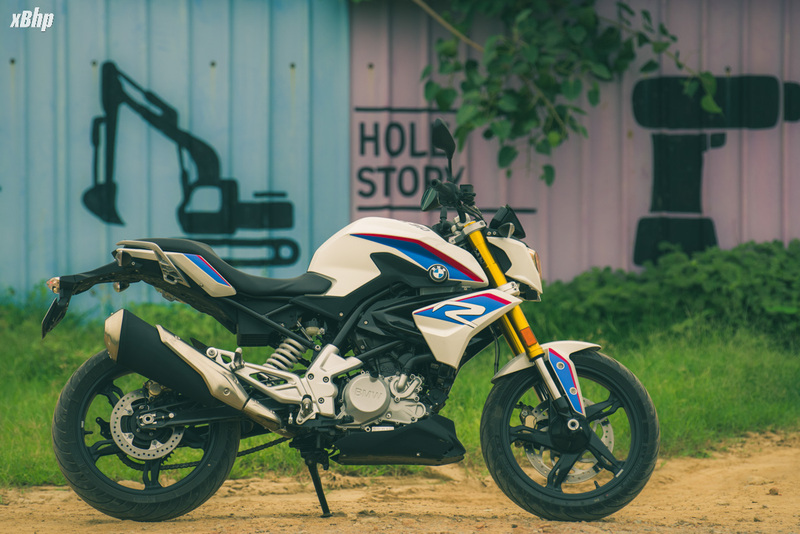 The competitors have already carved a niche for themselves and that is why we called the BMW G 310 R a latecomer but then again, be it Tony Stark or Bruce Wayne, the good ones are usually late. Let’s see if the little Beemer Roadster can earn the right to be called the Iron Man or Batman. BMW Motorrad has always been associated with very handsome looking roadsters. 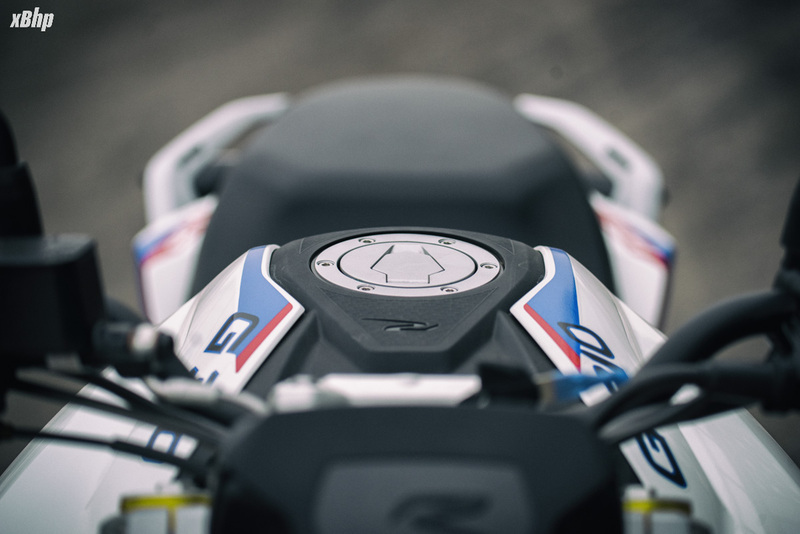 Be it the R 1200 R, S 1000 R or the F 800 R, they are all stripped down and loaded up ready to take it to the streets. 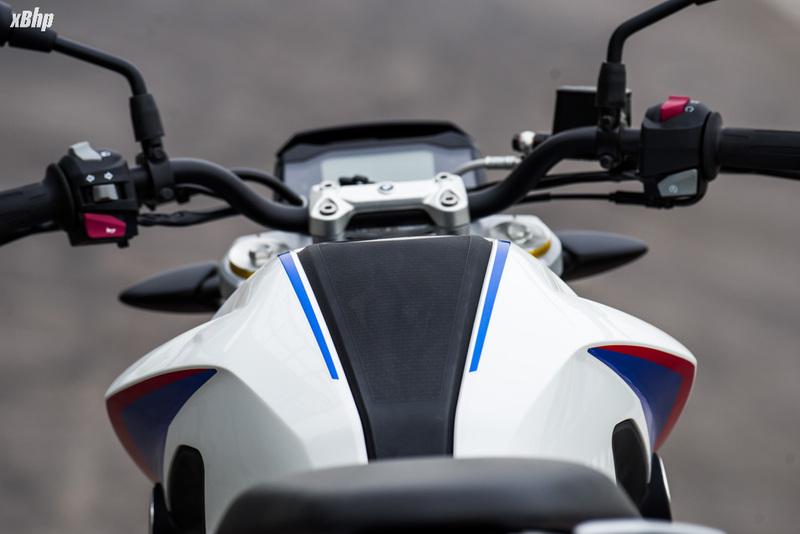 The BMW G 310 R follows the same design language and looks purposeful. 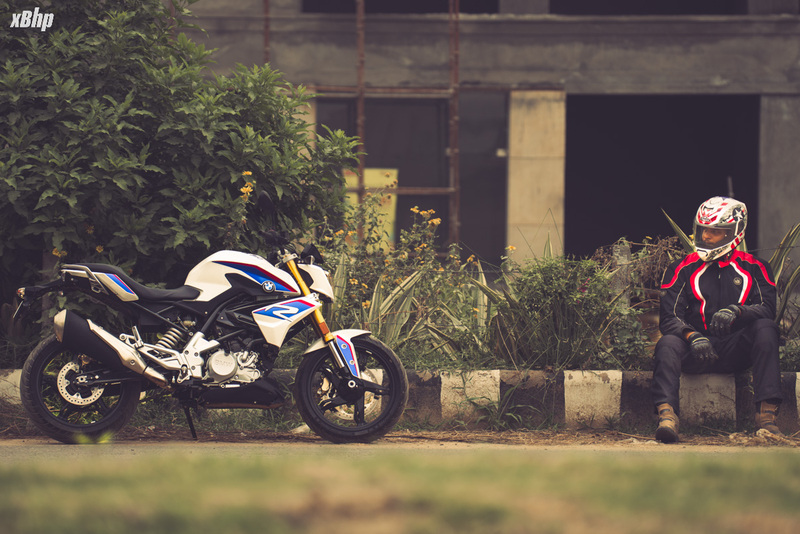 If one had to pick a motorcycle from which the G 310 R has taken the most cues, it’d surely be the F 800 R. And when it comes to inspiration for a motorcycle, the F 800 R is not a bad motorcycle to go to by a long shot. As a result the G 310 R looks very proportionate and possesses an aggressive stance that matches its roadster family lineage. 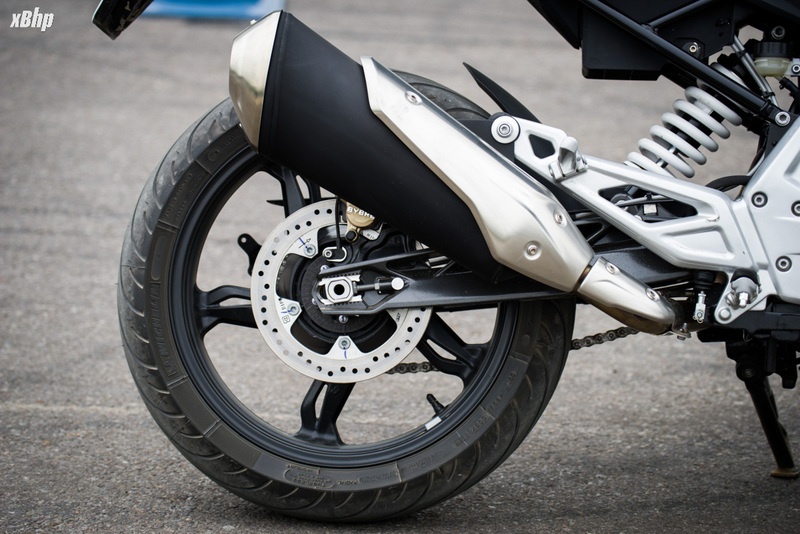 Where the gold anodized forks and brake calipers make the little roadster look premium, the compact shrouded headlamp and sculpted muscular tank lend it the street fighter look. 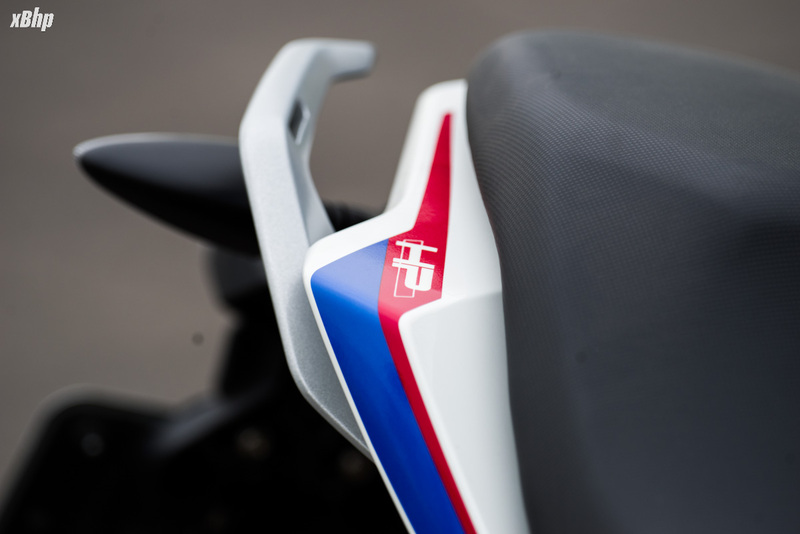 The belly pan and the bikini fairing, which has the ‘R’ imprint, look spot on and the minimalistic rear compliments the overall stripped down feel. Cast aluminum wheels shod with fat Michelin rubber compliment the motorcycle and in the Pearl white metallic paint scheme, it stands out from the crowd and garners a lot of attention on the road which in most cases a good thing. We all want to be rockstars anyways! Looks of a motorcycle are always debatable as different people have different tastes and different takes. But I personally love the naked street fighters and the G 310 R with its beautiful paint scheme is right up there at the top. Inspiration from the elders of the family has worked in the favor of the G 310 R it scores a perfect 5/5 in the looks department. 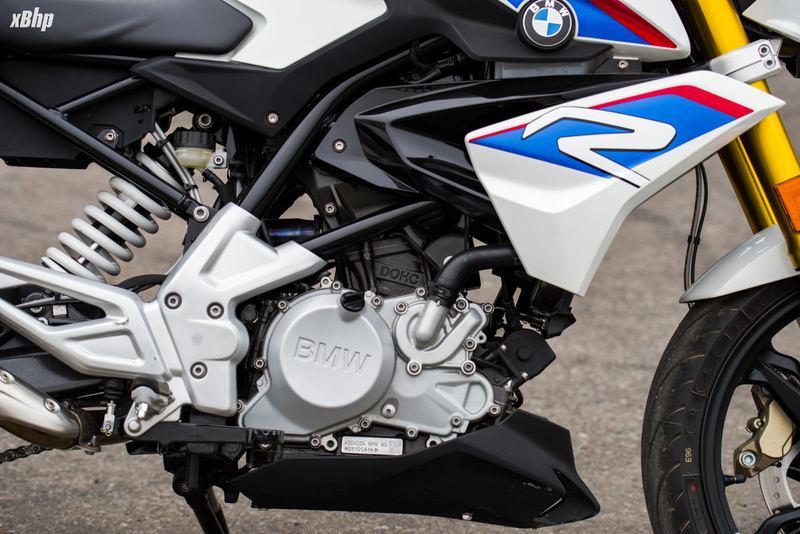 The engine on the BMW G 310 R is the same as the BMW G 310 GS - A 313 cc liquid-cooled unit which produces 34 Ps of power and 28 Nm of torque at 9500 rpm and 7500 rpm respectively. But the engine feels very different on the R than on the GS. It feels punchier and more powerful, which can be attributed to the fact that the G 310 R is lighter than the GS. The power delivery also feels a bit more urgent, yet linear throughout, which provides the G 310 R with smooth acceleration. It does not feel non-aggressive, it is just smooth. 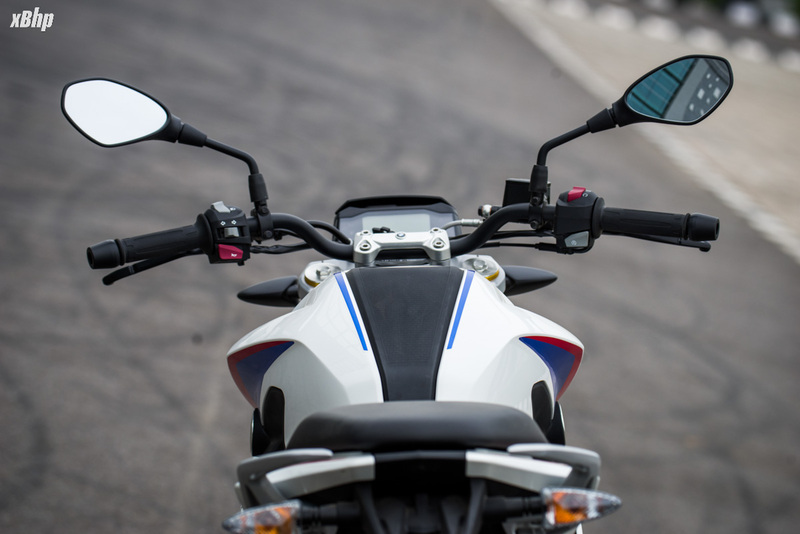 The 34 Ps produced by the G 310 R feels ample for the street and the highways alike. Again, being a single cylinder, the engine in the G 310 R is characteristically buzzy, but I can vouch for the fact that the refinement is a lot better than a lot of other single cylinder motorcycles. Some vibes creep into the footpegs and handlebars at higher RPMs but the effect is more pronounced on the footpegs than on the handlebars. It shouldn’t be a deal-breaker though. The motor is very tractable and has a very pronounced mid-range and a respectable top end. I tested the R extensively for signs of knocking and hesitation when going slow in higher gears. In the 6th gear at 3000 rpm the motorcycle did around 50 kmph and felt quite comfortable. I tried to accelerate from there without downshifting and the motorcycle showed slight hesitation for a fraction of a second but pulled effortlessly afterwards. 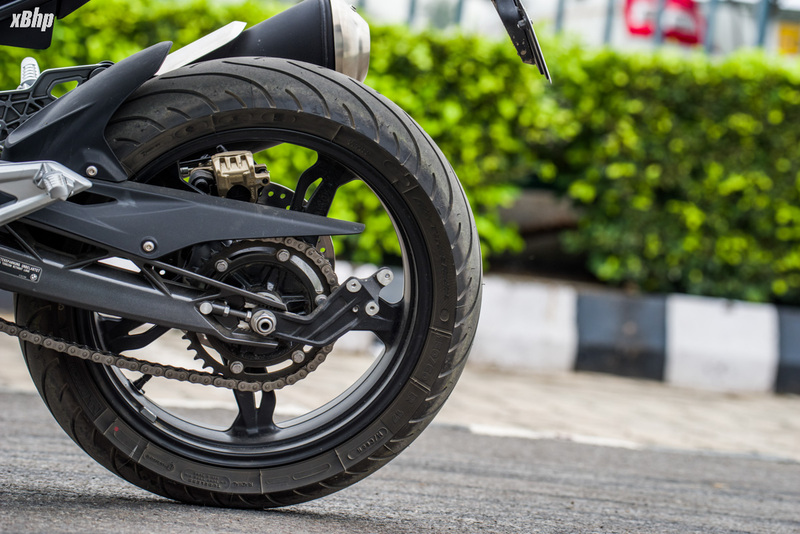 So, the motorcycle would be a joy to ride in the city and won’t require a lot of gear changes, not that one won’t want to because the clutch action is soft and the gearbox is slick and precise. The gears change with the slightest of push on the lever and settle in the previous or next gear with a beautiful click. It’s a joy to go through the gearbox of the G 310 R. The heat management seemed nice, but we are yet to test it in bumper to bumper traffic for that. 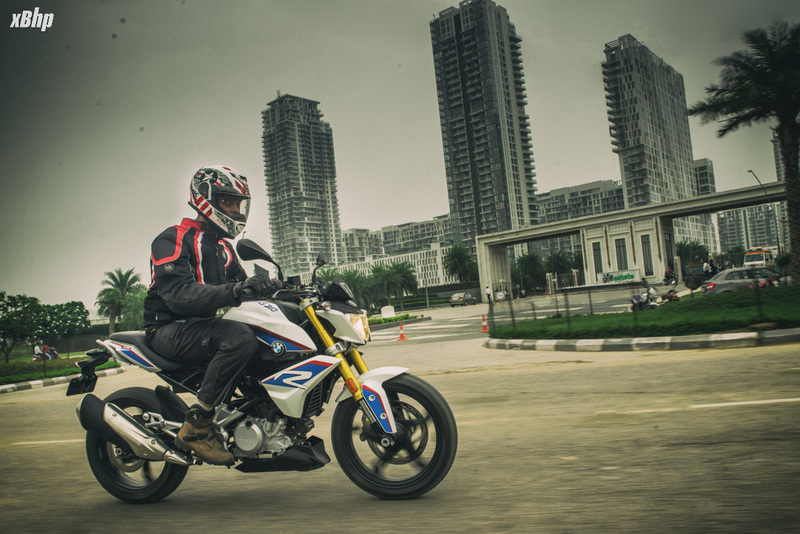 The G 310 R is quite quick on its feet and the throttle is very responsive and crisp. Fueling is also spot on. The exhaust note at the higher revs is commendable and if one likes spirited riding, their ears are going to be mighty pleased. There is another issue except the vibes though. The G 310 R also suffers from a feeble low end like the GS and will stall if the engine is not spinning at a sufficiently high rpm. That is something one must be vary of during slow speed maneuvers. Although I managed not letting it stall during the slalom test, but I can tell it was very close. So, the engine scores 4.5/5 on the G 310 R.
This is the part where the GS impressed us the most and same is the case with the G 310 R. It is a lithe little machine and so quick on the feet that it is just too boring to ride the R in a straight line. The reverse inclined engine enabled the engineers to fit a longer swingarm without inevitably increasing the wheelbase in the process. 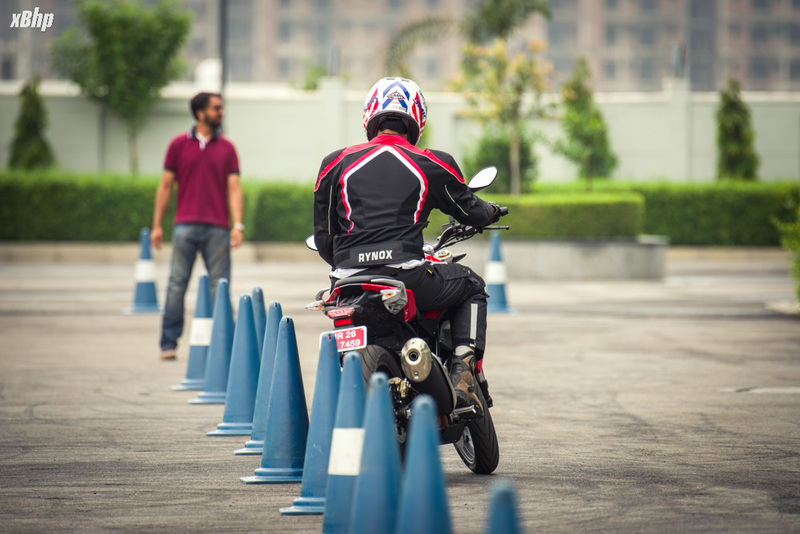 The real representation of this little technique was so apparent on the G 310 R that even the decreasing gap between the cones during the slalom test did not seem to affect the motorcycle the least bit. Taking the GS out on the rough roads was a bit painful. Not physically, but psychologically because such a beautiful motorcycle should not be abused. Anyway, the suspension is a bit on the stiffer side which does aid handling and stability in the corners but also makes the potholes and undulations quite apparent. They are not stiff to a degree where the bike feels uncomfortable, but somewhat stiff nonetheless. I just mentioned corners. The G 310 R feels like that baby from 3 Idiots that kicks when one says aal izz well. It’s just that it kicks when it hears corners. It is capable of quick directional changes and feels extremely surefooted in the corners. The chassis is rocksteady and the feedback is wonderful as well. 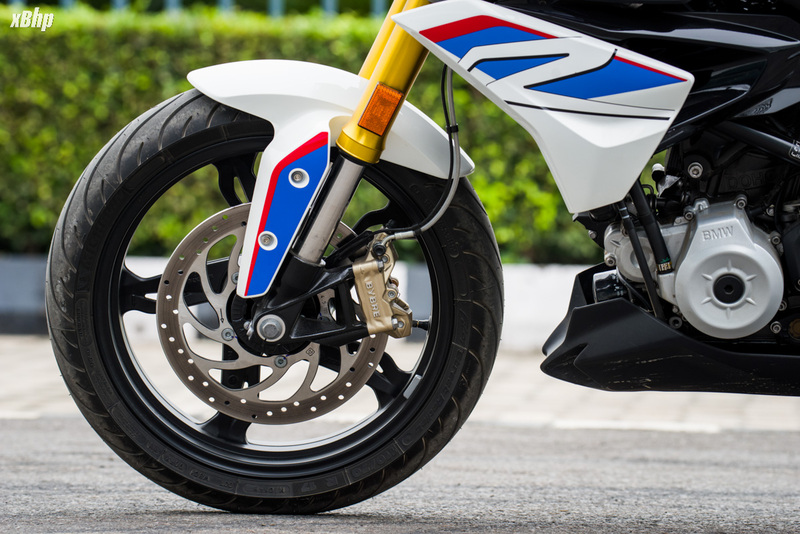 Braking is another department where the G 310 R shines and these are easily one of the best brakes in its class. 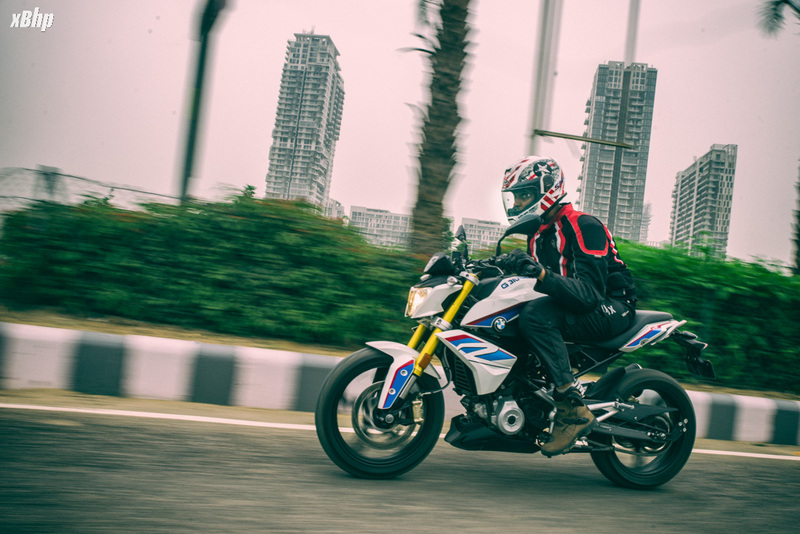 The bite, the progression, the feedback and the dual-channel ABS (non-switchable), everything is spot on and can bring the G 310 R to a halt from triple digits in a jiffy. Now, I would have liked the tyres to offer a little more grip and feedback. 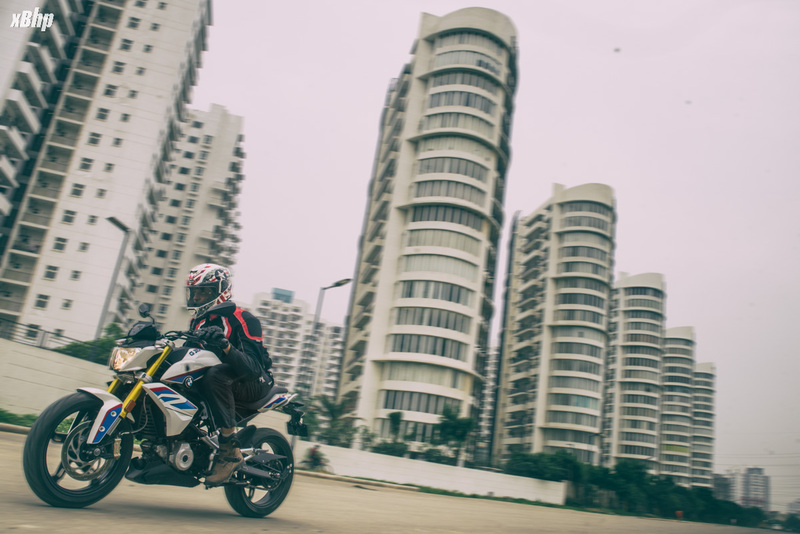 Believe me when I say this that the tyres are great, but they fall a bit short when compared to the capabilities of the G 310 R. All in all, I really liked the handling of the G 310 R and it easily scores 4.5/5 which could have been a perfect 5/5 if the tyres were just a tad bit better. Snuggly refers to the comfort that the G 310 R offers, little because of the size but why a rascal? I just wanted to call it that because of the way it looks even when standing still. It just wants to be ridden all the time, that’s how dynamic it is. Oh wait, this is the riding comfort section. Apologies. The G 310 R is a fairly comfortable motorcycle. 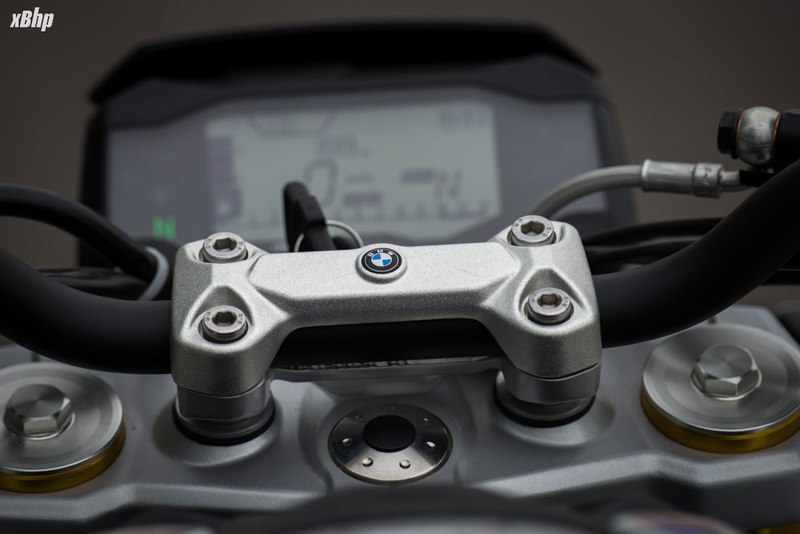 The footpegs are somewhere in between rear-set and forward set and the same goes for the handlebars, neither too low nor too high. 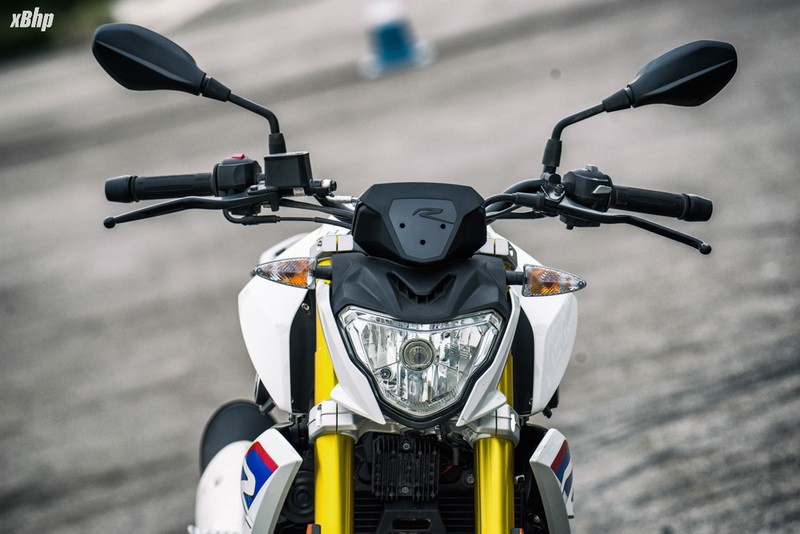 The seat is one of the best of the bunch and it is 785 mm high which should make the G 310 R very accessible to relatively shorter riders as well. The surprising thing was how accommodating the G 310 R is despite its smaller size. I was able to grip the tank perfectly with my knees despite my height being north of 6’. 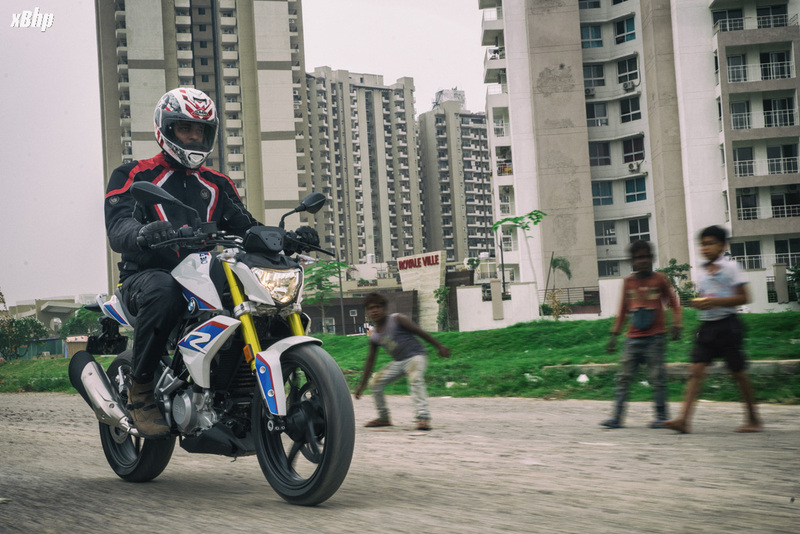 Comparatively shorter riders also seemed to be quite comfortable with the G 310 R. Therefore, this little rascal might prove to be a comfortable motorcycle if one would like to spend a few hours with it. 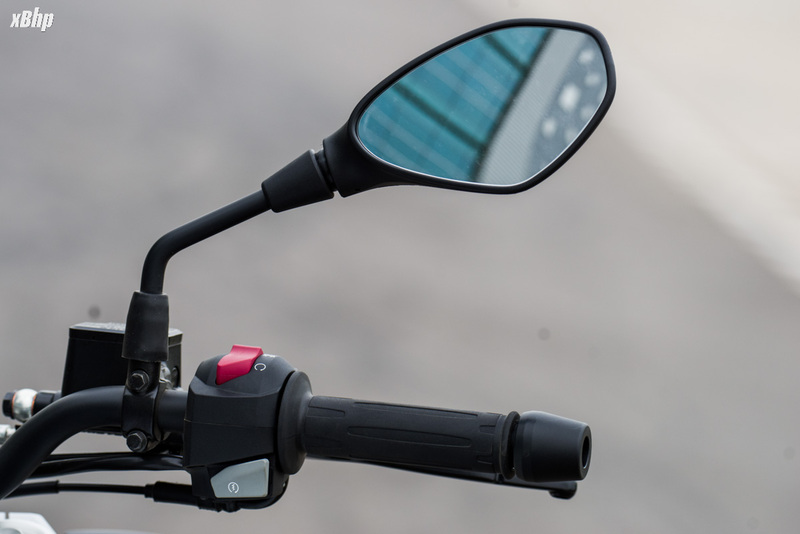 The lack of the windscreen might be an issue for those long highway runs as the bike can easily do triple-digits and the windblast would grant you some pain in the neck for fulfilling thine high velocity desires. Another small niggle is that the motorcycle on the whole, is quite accommodating but the seat is rather small-ish and doesn’t provide the rider enough room to move around comfortably. So on the comfort scale, the G 310 R scores 4/5. Mileage: Not much can be said in this department until we get the bike for a proper road test but it might be able to manage around 30 kmpl. 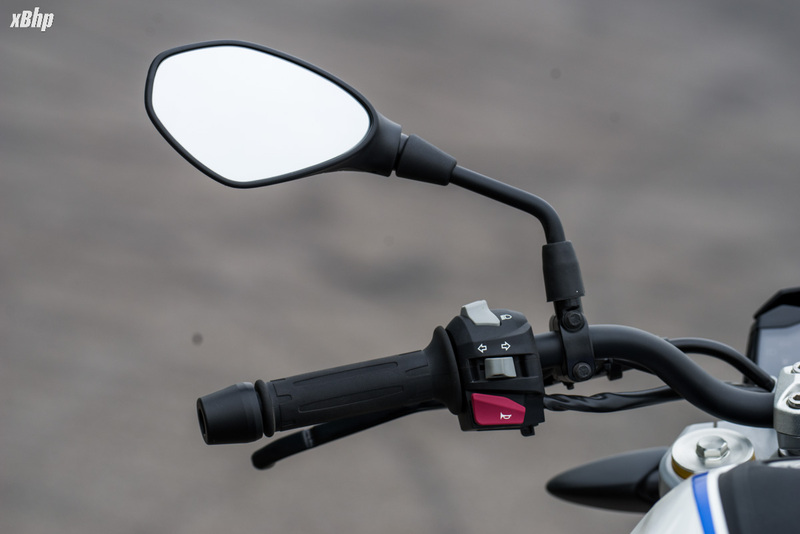 Rear-view mirror visibility: The small-ish rear-view mirrors offer a good view of the road behind the rider but the vision is distorted slightly at the higher revs due to the vibes. 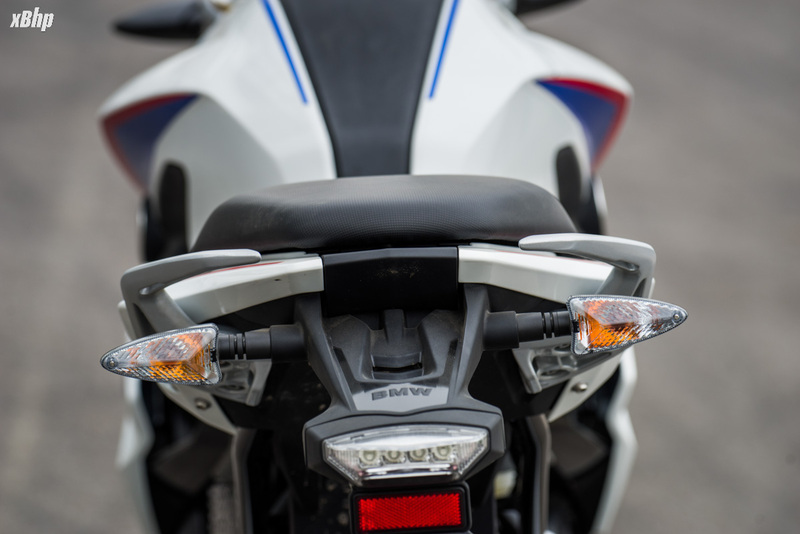 Headlight performance: Again, not much can be said until we get the bike for a long term review. Build Quality: No matter how much I say about the bike’s build quality, it’ll always fall short when it compared to being with the bike in person. Flawless. BMW. That’s all I am going to say. Instrument Cluster: Fully-digital LCD unit with all the essentials and nothing out of the ordinary. The quality of the switchgear is pretty neat and buttons feel very tactile and sturdy. Time for a verdict huh? Okay. If I was ever to be biased writing a review of a motorcycle, it’d be for this one. It is just pure joy. It is like that kid who always wears a smile on his face, a lively and mischievous kid. It is lovable. A beautiful engine, wonderful handling and such good looks, it is a motorcycle that coerces one to own it. Just like the GS, the BMW badge does ask for a premium as this one is priced at INR 2.99 lakhs (Ex-Showroom, Delhi). 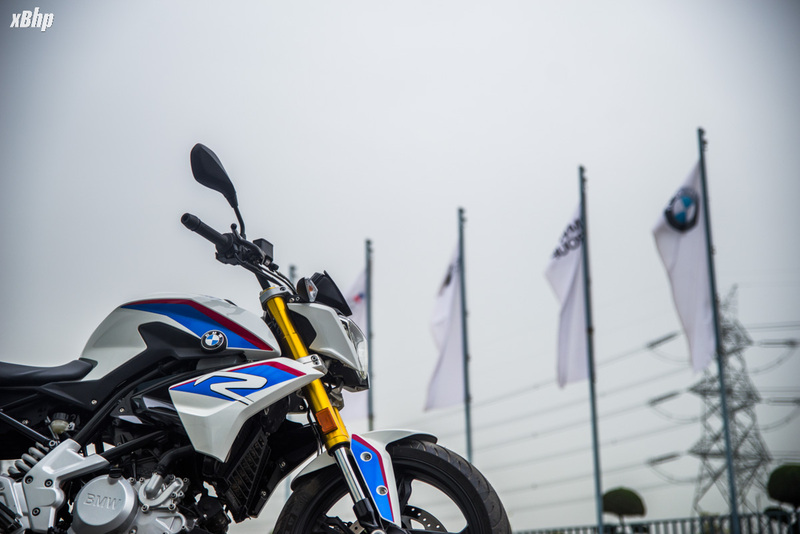 Some of the competitors even undercut it by a considerable margin, but I’ll vouch for the R and stick my neck out to say that the G 310 R, BMW or not, is a brilliant little motorcycle. 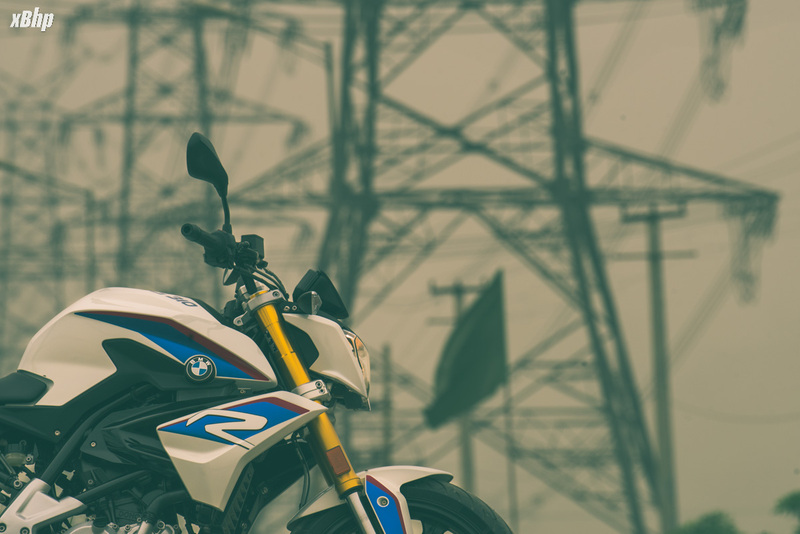 The competition in the segment is stiff and the options are plenty and many more might be on their way, but the BMW has a very special place in the segment and even those who disagree, a test ride, if not able to change your mind, will surely intensify the dilemma. Last edited by xBhp; 08-09-2018 at 12:44 PM. Good review btw! I guess the brakes are spot on. And the bike is built how it should be, solid. Both BMW and Indian consumers are wrong from the price perspective. ₹2,99,000 for a mere 300cc single cylinder 34bhp bike is too much in my opinion. There a plenty of options in the market for the same or lesser price with superior power. Duke, Dominar are examples. And Kawasaki put a check to BMW by pricing the Ninja 300 at ₹2,98,000. Ninja 300 is a dual cylinder more refined than G310. 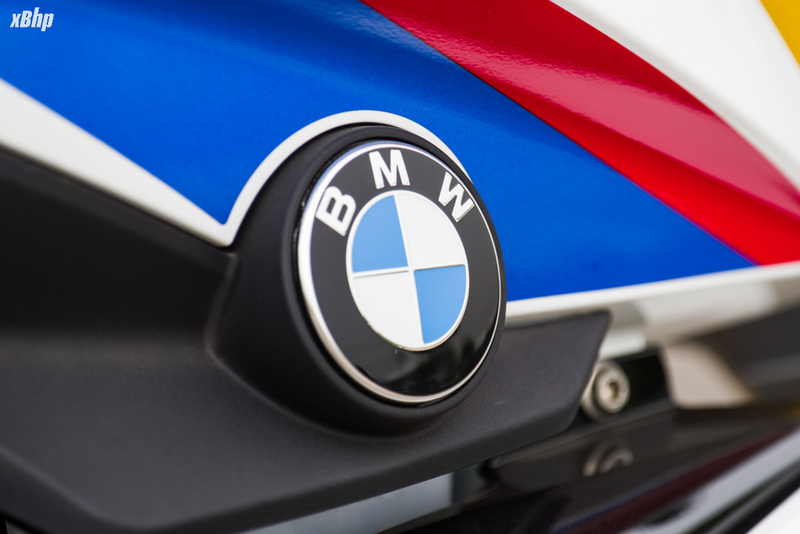 Coming to the Indian consumer, we expected too much from BMW with regards to the price. Expecting BMW to sell G310 at sub ₹2.5lakh mark because is made in India is like expecting Jaguar or Land Rover to sell their car under sub ₹20Lakhs as they are owned by TATA. BMW always emphasized G310 as the cheapest BMW we can buy and they did it. Not for the average Indian but it is the cheapest BMW if you can afford ! Price should've been lesser by 10-15% at least! A bike on the road is worth two in the shed. Just for a BMW batch they charge so much more, while offering so much less technology or anything such as accessories..
Coming to the Indian consumer, we expected too much from BMW with regards to the price. Expecting BMW to sell G310 at sub ₹2.5lakh mark because is made in India is like expecting Jaguar or Land Rover to sell their car under sub ₹20Lakhs as they are owned by TATA. BMW always emphasized G310 as the cheapest BMW we can buy and they did it. Not for the average Indian but it is the cheapest BMW if you can afford ! Mini beamers are made in India (and is priced costlier than US may be because they can't service with just few service centres-i experienced it too) so expectation is so to have competitive pricing. Comparing it with Jags and Land Rovers which are made in some other country is not apt! Their customer service is questionable or rather i would strongly say POOR.. i cancelled my booking of G310R as i didn't feel great with the bike after my test ride hence cancelled officially on 25th July and haven't received my booking advance refunded yet! My follow up too was unanswered, which is unacceptable. BMW dealer is not ready to respond on the advance refund which showcase very poor management and service they have even after years of delayed launch of baby beamers. If any one has better means to reach BMW to get my refund back (its more than 40 days now since i cancelled) will be helpful. I got my money back when team bhp member Turbanator intervened. 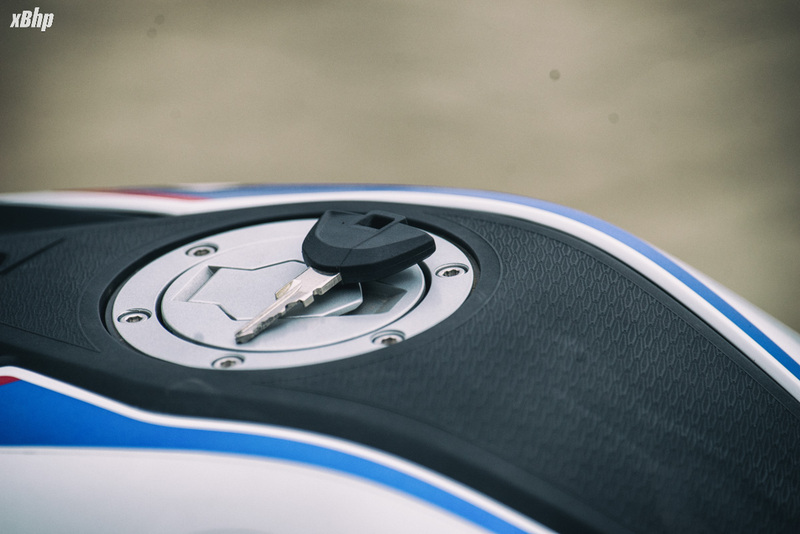 Which location did you get your motorbike booked from? That's hopeful and shows all over they are delaying a lot. I booked from Chennai, Tamil Nadu. At last after so many follow ups and poor/non customer friendly replies from the dealer i got my advance back after 50 days from the date of cancellation. 1000th Ninja Sold in India and commencement of operations of India Kawasaki Motors! All times are GMT +6.5. The time now is 10:57 AM.